The view from our bedroom. Some days it's hard to believe that the Pyrenees are over 50 kilometres away! Wet weather for weeks has created a bumper crop of snails. 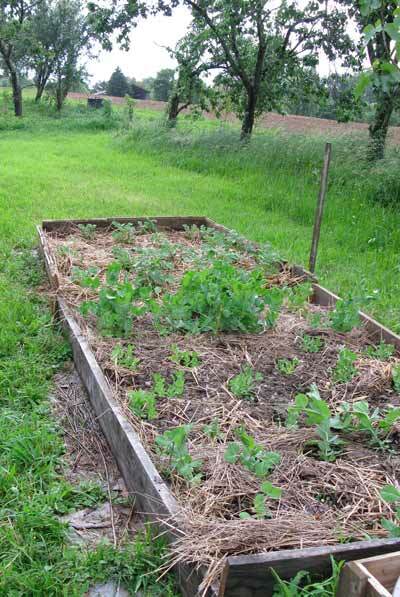 The no-dig raised bed that we built in March started to produce potatoes, broad beans and peas. 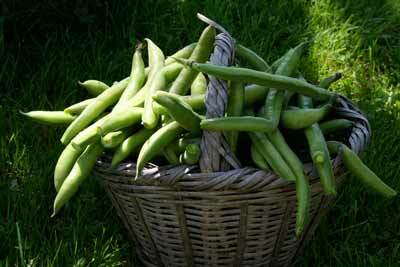 Broad beans, with a slice of ham and mustard. Mmmmmmm! Now, while most northern Europeans were beginning to expose their white bits to gloriously unseasonal spring sunshine, we were still in Noah mode. The mimosa and daffodils were on the wane and the cherry blossom daring to blush and bloom, yet the weather was extremely wet and stubbornly dragging its feet. Our log burner was in service long into May, although we finally only lit it in the evenings, since we could begin to get out of the house and do things in the garden. The vegetable garden was like the Somme. Clay sticking to our boots in enormous, slippery clumps, snails and slugs gobbling up any shoot silly enough to pop its head above ground. They'd normally come out at night, but they were doing a 24/24 shift on anything green within our 12 x 12 metre patch. No amount of (eco) slug pellets worked. So we resorted to large scale culling, using boots, spades and secatures to bring the coup de grâce to these vivid orange or large-shelled grazers. All along the edge of our property there are elderberry trees. Far enough away from any traffic to be free of any toxins and within easy reach. They grow in what were the old lanes between fields. Walked along for hundreds of years with wagons, goods and animals. Nowadays, the fields have become bigger, the hedgerows are far fewer and the wildlife has less cover. Deer spend the day there, under the dense cover. Owls too. A nightingale has nested there every year we've been here; singing through the night and most of the day, its beautiful repertoire of arias, sonnets and soul. Each time we wander across to try and spot him, he stops, impossible to see. For such an exhibitionist, he wears very plain clothes. We have planted almost thirty trees and bushes around our grounds, mostly for their fruit or nuts, but also for shade, for cover from the neighbours and the small road at the end of our lane. They have become havens and restaurants for all sorts of animals and birds, so we get double the pleasure from them. 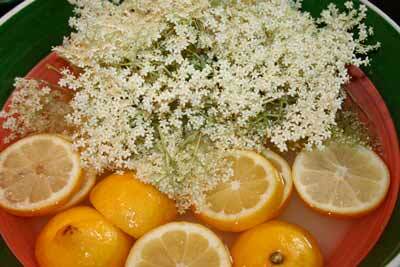 For the second year Caroline gathered the elderflowers and made a refreshing syrup. With no conservatives it needs to be drunk within a week or frozen. We do both and the pure, sweet nectar is like nothing you get out of a can. The raised bed that we put together last month has already started to pay itself back. With a bottom layer of old newspaper, then home-made compost, hay and all sorts of other stuff, like ash, Caroline planted her first seeds. Within days, the first sprouts broke through and very soon a bumper crop of potatoes, broad beans and peas were pushing for the sky, fired up by the rich earth. 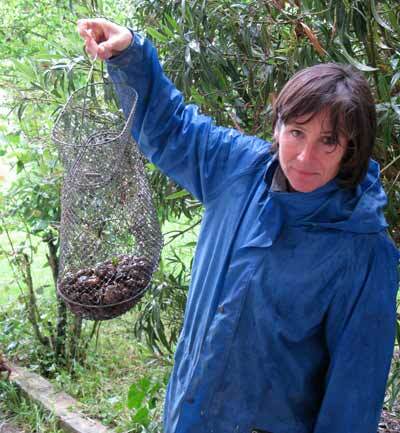 The beauty of your own garden is wandering over with a knife and basket and plucking what you need for the day. No weed killer, fertiliser colouring or preserving spray, just pure nature. So fresh from the plant, the flavour is uncomparable. Caroline's brother, Jeroen, came over for a week of DIY. We'd planned to create a chicken coop for a while and had finally decided to convert the old pig sty. With four walls and a window, the main structure was in place. Just a case of replacing the half doors, filling up the gap between the sty walls and the ceiling and adding wooden bars for the chickens to roost. As always, a job like this involved so much more, like adding lighting, plugging rat runs with cement and creating a sliding door at the window. 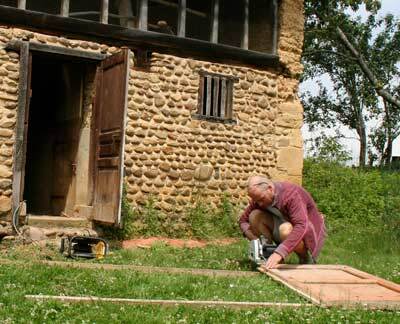 With the radio blaring, drilling, hammering and sawing, it was a hive of activity as Jeroen slowly put it all together using as much recycled material as he could find in the two barns and Perry's tool boxes, who came to help when he could, between work projects. Next step, building the fence for the run, outside. Thanks Jeronimo!